Though the Catholic Church only requires 14 years old and older to abstain from meat on Ash Wednesday, on all Fridays of Lent, and on Good Friday, my parents let me and my brother join the fun even when we were below 14. I really don't remember my exact age when I started doing seafood and veggie Fridays during Lent. All I remember is that my mom was very strict about it. There were even times when she made us abstain from meat for the whole period of Lent which means 40 days straight. But my brother and I have always loved seafood and veggies so it wasn't like a big torture for us. We were actually fine with that. It's very much the same with my daughters now. They love seafood and (some) vegetables so Ryan and I don't even have to force them to abstain from beef, pork and poultry. They've learned from church about the importance of this Catholic tradition and though they know that they are not yet required to observe it, they are very willing to. They are actually the ones who remind me that it's Friday so I will have to pack meat-free lunch for them. 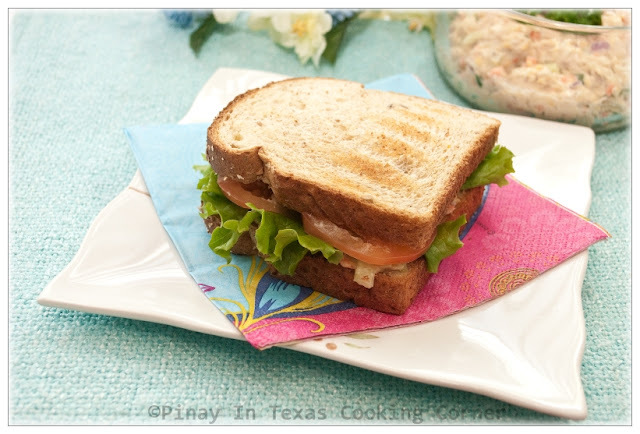 Most of the time, my daughters prefer to eat sandwiches and fruits for lunch in school, and this Cheesy Tuna Sandwich Spread that I am sharing with you today is one of their favorite fillings. 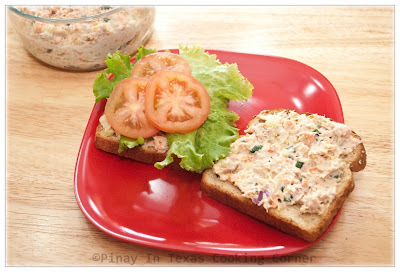 Like the Salmon Sandwich Spread that I have featured last year, this is not any ordinary fish sandwich spread. It's very flavorful and it has cheese!!! Clarise and Cherlin love how cheesy and healthy this is...and they find eating it in sandwich rolls so much fun! I'm sure you'll love it too. 1. Empty the cans of tuna (including the olive oil) in a bowl. Using a fork or spoon, flake the tuna. 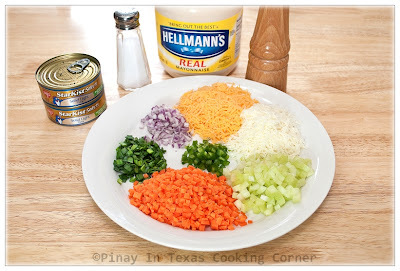 Add the rest of the ingredients and mix well. 2. Apply tuna spread on both slices of bread. Garnish with green leafy lettuce and tomatoes in the middle (optional). 1. 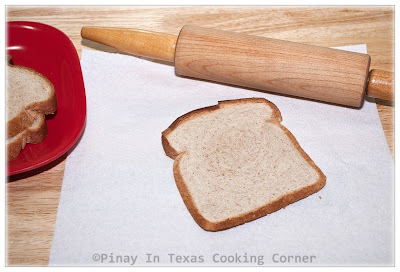 Place a slice of bread on a flat surface and use a rolling pin to flatten it. You may remove the crust if you want. 2. 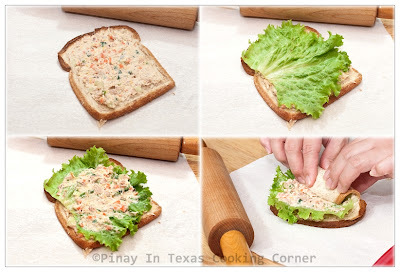 Apply tuna spread on the bread, leaving about ½ inch space on all sides. Put a lettuce leaf on top of the spread. Apply another layer of spread on the lettuce. Roll up the bread tightly to enclose the filling. 3. 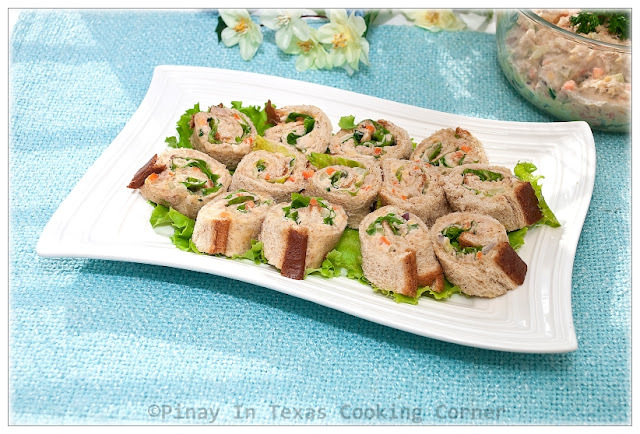 Cut roll crosswise into 4 slices. Note: Transfer left-over spread in a tightly covered container and store in refrigerator. It will taste fresh up to 1 week. I have tons of tuna and veggies and I haven't made dinner yet today. 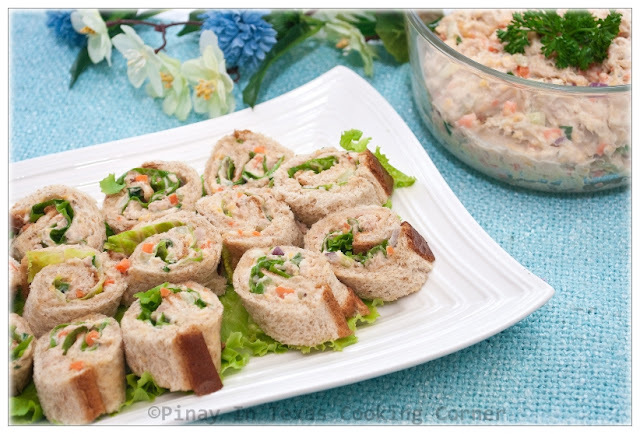 These Tuna Sandwich Rolls look both healthy and creative. As usual, you have taken normal ingredients and turned them into something exciting with your culinary magic! U R RECIPES R ALWAYS QUITE INTERESTING.....N THIS LUKS EASY N YUM TOO. You have prepared this with quite a bit of flair, making the spirals-they look great. Also, the tuna salad has some unique flavor additions that I want to try. Thanks for posting this one, enjoy the weekend! These sandwich rolls are such a hit & I make them often for parties. I'm sure your kids finished them all in no time. Tuna has so much goodness in them & it's great for kids too. Lovely post, dear! Chk out my Happy Call Recipe: Fluffy Minced Pork Omelette too :) Enjoy your weekend, Tina! Your children are so sweet, reminding you if it's Friday. Now that Holy week is tomorrow na, this is perfect. Its also the same over here with the Catholics, abstaining from meat during Lent and Fridays. Though we are not Catholics, we too take a break from meat, in fact not much of meat dishes at home and my hubby prefers all the way for fish. Thats a lovely way of preparing the salad esp the rolled ones. Very creative I must say compared to the normal of filling the bread slices and topping with cheese. 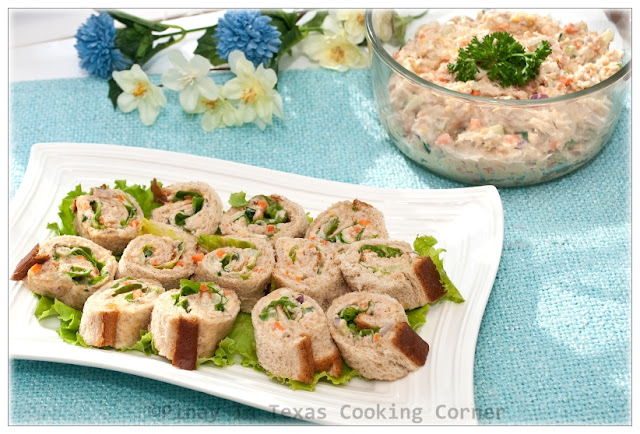 Perfect rolls for a simple meal and also for a party start up. Meat-free for 40 days ?! Oh well , as long as there are seafood and veggies hahahha That is much more appetizing than using only tuna and mayo :) Much more healthier , too ! 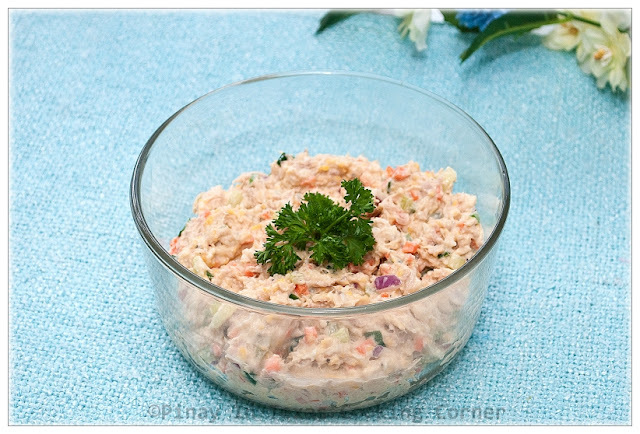 This is a great way to kick up boring tuna salad!! Looks yummy! That's how you make the sandwich roll! It's very pretty. I've seen them in some bento box, but didn't know you have to flatten the bread first. Very good recipe for kids party etc! Delicious spread! Lovely twist to the good ol' tuna salad. 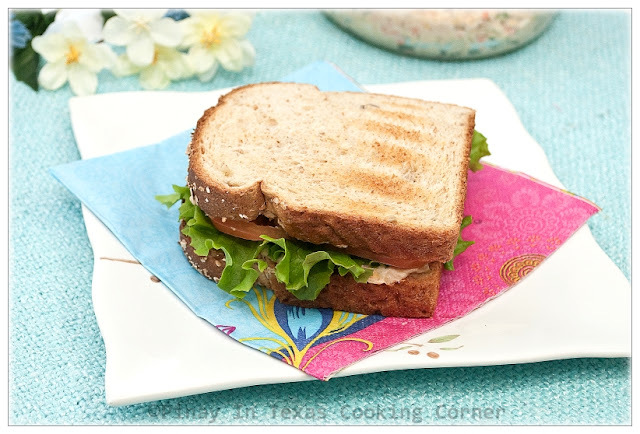 On yummy - tuna salad sandwiches - my favorite! Love the addition of the cheese and the jalapeno! This is brilliant. These sushi-bread rolls are great party food. These roll ups are too cute! Aw it is like sandwich sushi! Cute, I can see why they love eating them. All those vegetables in there must make it especially delicious.